barry Mann, co-writer of the number, probably recorded his version before that of Bobby Vee. The latter version, however, appears on the CD "The Originals," EVA 7895622. To add to the confusion, BJ Thomas seems to have had the first success with the number, reaching number 9 in the US Billboard charts in 1970. Barry Mann was born in 1939 in Brooklyn. Having started to write songs for his own pleasure at age twelve, he later left a career in architecture to become one of the most prolific songwriters of the late 1950s and early 1960s. 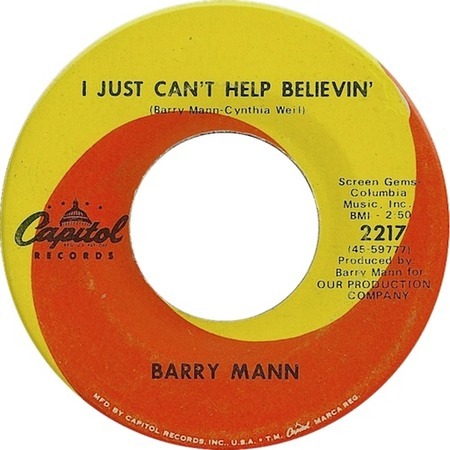 Many of his numbers were written together with his wife, Cynthia Weil, including "I Just Can't Help Believein'," recorded in February 1968 and released as the B-side of Capitol 2217. Somewhat confusingly, the A-side was titled "Where Do I Go From Here," but this is a different song to that of the same title recorded by Elvis in 1972.